Home » Disney Memories » Recent Posts » Who’s Ready for Spring? 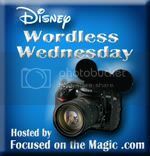 Thanks to Focused on the Magic for hosting Wordless Wednesday! The theme this week is “March calendar shot.” It has been a long, cold winter, and I’m ready for Spring – even if the weather isn’t. To hurry things along, I’m sharing one of my favorite moments from our trip to Walt Disney World in January. That’s my horde, eating ice cream. In January. Take that, Winter! Tink Voted on Wordless Wednesday!